This is me wearing my very stylish top hat. My stovepipe hat is taller and is one I wear with my super hero cape. When I start out in the morning of a day off, I’m never quite sure what I’ll end up wearing (other than my pj’s) at the end of the day. Today was no different. I started out in my black with pink pinstripe pants, a thin maroon waffle style long john shirt (long sleeve) with a brown shirt that has yellow letters declaring “I’m a Hugger” on the front with a picture of a bear. Around my neck I decided to wear my mini-harmonica necklace and my Chinese chime necklace so I’d have music all day long. 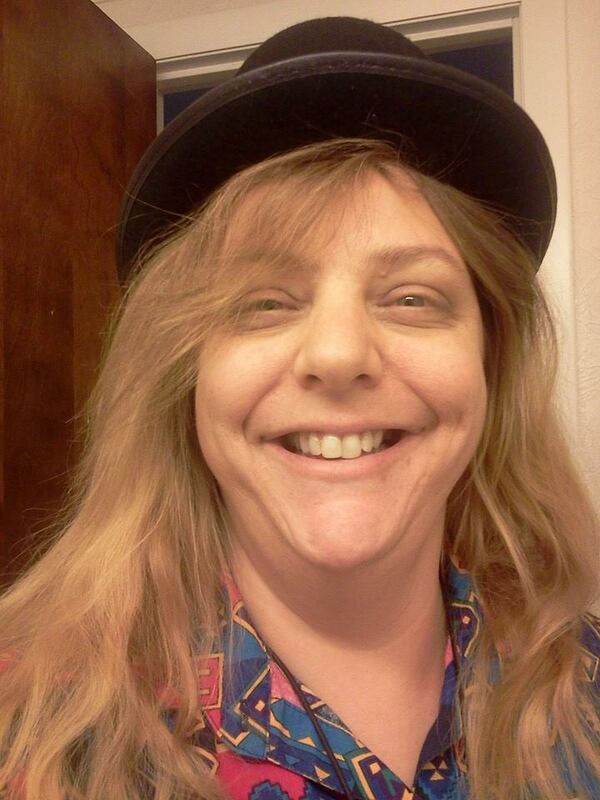 Although I normally opt for a hat to wear, I instead bottomed off the outfit with some black and gray DC skater shoes that I got at the Salvation Army store for a quarter. I showed up at the first event of the day which was an end of an era rummage sale reminiscent of the video game Skyrim’s Whiterun General Store proprietor, Belethor, who states with great creepiness, “Everything’s for sale! I’d sell my sister if I had one!” But seriously, they were selling everything. On the table I migrated to tidy and fix were all the Unitarian Universalist shirts left over from various events. They were nearly all children and youth sizes which I kept folding and arranging according to style. There were also some Halloween costumes which included a rather boring flapper’s dress, a sofa cover floral skirt, an adult’s clown costume with bells at the ankles and wrist but none on the hat, a child’s clown costume that looked as if it were as old as the church (1956), a stack of 10 sombreros (one of which was bright purple and traditional in decoration), a flattened witches hat, and a black graduation cap with the tassel that read 2006. SCORE! I put on the cap and let the thick yellow tassel dangle around my face. It fit surprisingly well. After straightening a few other tables, I discovered a white beard (no mustache) with a working elastic string to hold it in place. On went the beard to add to my growing ensemble. I engaged people in conversations, helped them sort through the things we had left, moved 80 chairs to be moved from our soon to be absent church to the Ecumenical Storehouse (where the not so well off can get home furnishings (and those who lost homes to fires or the like) transport truck. I chatted it up with friends, rearranged merchandise and enjoyed the time. One of the ladies, an artist, Ms. Seely, found a pair of Harry Potter glasses which, surprisingly were wearable and didn’t give me a headache. I found a gold framed mirror to check my appearance and stared into the eyes of a professor wizard. It made me giggle. I traveled from that event to the next wearing my new attire feeling incredibly lucky to be gifted with such oddities. When I arrived at the phone bank venue I was about to work, my friends didn’t recognize me until I spoke. That made my heart do flip-flops because these are people I work with on several important issues such as abortion rights and climate action. I removed the costume to demonstrate that I was ready to get down to business. Four pages of phone calls later, I was able to get the message out to about 35-40 Tennessee voters requesting their support if they didn’t already feel the same. When I left I felt accomplished as I redressed in my Professor’s costume. I drove home to collect my little dog and change attire. I wear the cape because I feel that when I’m doing community service (this time on behalf of Neighborhood Watch National Night Out), it is important to demonstrate in action, word, and mindfulness of others why you’re actually going there. I wear it as a reminder to myself that with great power comes great responsibility which I take, believe it or not, seriously. I don a top hat or a stovepipe hat in tribute to Honest Abe who is one of my favorite American heroes via his humanity. I feel strong and spiritually powerful when I wear the attire (plus, the cape was a birthday gift from a dear friend of mine named Max and was modified by another I adore Manderley). Yes, I would feel the same without the attire about myself and my actions, but it’s a physical manifestation for me, it harms nobody, brings delight and joy, and fills my spirit with even more loving feelings. Because I was busy with volunteer work over the last couple of days, I haven’t been home to check social media very much. I missed the announcement that cancelled the dog costume parade. I was disappointed in that because Piggy was subjected to two coats of strawberry shampoo (I swear that stuff requires a spoon it smells so good) and a purple and pink striped sparkle collar with matching leash to show off her shiny blue coat. They weren’t going to let me in until I promised to hold Piggy and keep her away from the food booths. I complied. I was just about to leave when a little girl in a pale blue dress, long blonde curls to her waist, and a pink balloon sword approached me with eyes wide. “Do you do any magic tricks?” She asked me while swinging the sword around in the air. “Well that’s a great question. Why wouldn’t I know a couple of magic tricks when I have an awesome hat like this?” I retort, more out loud than to her. I addressed her directly, “I’m sorry to disappoint you, I just like to wear top hats and super hero capes.” I felt really bad. Actually, that’s not accurate. I felt guilty. I rubbed Piggy behind the ears as if she were suddenly going to pull a rabbit out of my hat which she didn’t do. “Well that’s okay.” She sighed with disappointment on her face for but a brief moment. “I can do a magic trick.” She declared. “No kidding? What can you do?” As I looked down into her face, I saw her thinking rapid fire of a response. “I don’t believe it. Will you show me?” She had me in the palm of her hand, the suspense was building in my guts as I wondered how in the world she’d pull off this impromptu show. She wriggled the balloon sword around in her hands, trying to remember or trying to discover the secrets. With inspiration striking, she worked the “sword” tip into the handle and placed it on her head. “I now have a hat.” She declared with a grin. If I wasn’t holding my little dog, I would have applauded. “That’s pretty impressive.” I chuckled, “I wouldn’t have thought of that.” I said as the balloon tip slipped out of the handle with a lightly audible pop sound. She grabbed the balloon sword and remade the hat, crowning herself once again. “I can do another magic trick, you wanna see?” She asked taking the converted hat from her head. “I can turn this hat into an umbrella.” She twisted at the waist which made the hem of her dress flare out a bit. I glanced the crowd to see who else was watching but it seemed this was just a one woman show with an audience of two (Yes, I’m counting Piggy Suey). “I told you I could do it.” She glowed with pride. “No kidding? Wanna show me?” Piggy snorted with impatience as I stroked her neck near her shiny new collar. Piggy settled back into my arms and I was so intrigued with this little magician’s tricks I just HAD to see how the show concluded. She nodded confidently and tugged at the wad until it was a looser wad but generally resembled a child’s drawing of a daisy. She pulled the balloon back into the shape of a sword and if I didn’t know better, I’d swear she winked before she began to twist the tip of the “sword” into about a three inch ball. With a flourish that would make D’Artagnan proud, she thrust the sword forward, then slashed the sword with a backhand followed with one final riposte with the unsuspecting chair she’d attacked in earnest and her balloon popped. She stood there with the pink former sword/hat/umbrella/flower/sharpened sword dangling dead in her hands. She looked more surprised than shocked or disappointed. She smiled at me. I smiled back. “Thanks for the show. It was spectacular.” I tried to comfort her with my appreciation. “I know it was.” She grinned, dropped the dead show on the ground and ran into the crowd. I’m not sure, but I believe with all my heart, I created more magic by not knowing a magic trick than if I had been knowledgeable. I’m still grinning from ear to ear. I am indeed a blessed and lucky woman because I see the magic around me in every day people doing mundane things with such perfect humanity that it just makes my heart sing. Thank you little magic girl. May your magic always be in your hands. This entry was posted in B.U.T.Ful, Causes, Faith, Human, Love, Love Thy Neighbor, Observations, Ridiculousness, Short Story, Wild Woman and tagged delight, events, girl, happy, magic show, Piggy, short story, surprise, unexpected. 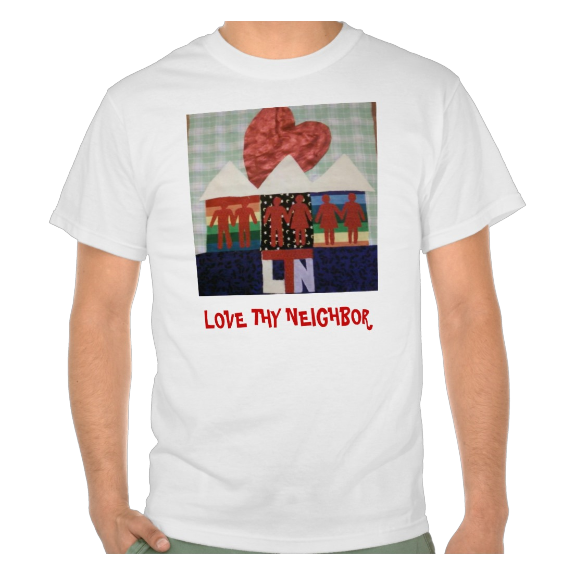 ← Love Thy Neighbor: FOR SALE! I finally read this story. How delightful. This is fabulous! What a wonderful story!